Home, they say, is where the heart is – and never is that more true than around Valentine’s Day. It’s the perfect time to rekindle your home’s look with decorations that ensure love really is in the air. So why not take some inspiration from Cupid and the season of love to create inviting décor that brings you and your loved ones closer together. There are few things more romantic than candles, but there’s more to it than simply placing a couple on a table. This is a wonderful opportunity to decorate and arrange candles to create a focal point that gently sets the theme. All you’ll need to begin with is some sheet wax, some heart-shaped craft punches and a couple of candles with some serious girth. Size matters here, because thicker candles means you have a larger canvas to work on. Start by creating heart shapes in the sheet wax – varying sizes and colors will bring the best results. 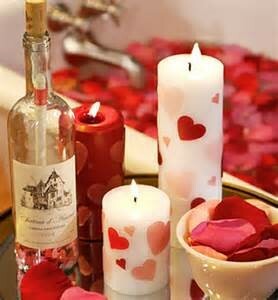 Next, use a hair dryer to lightly soften the hearts and decorate your candle with them. It’s simple, but it’s so, so effective in setting the Valentine’s Day tone. 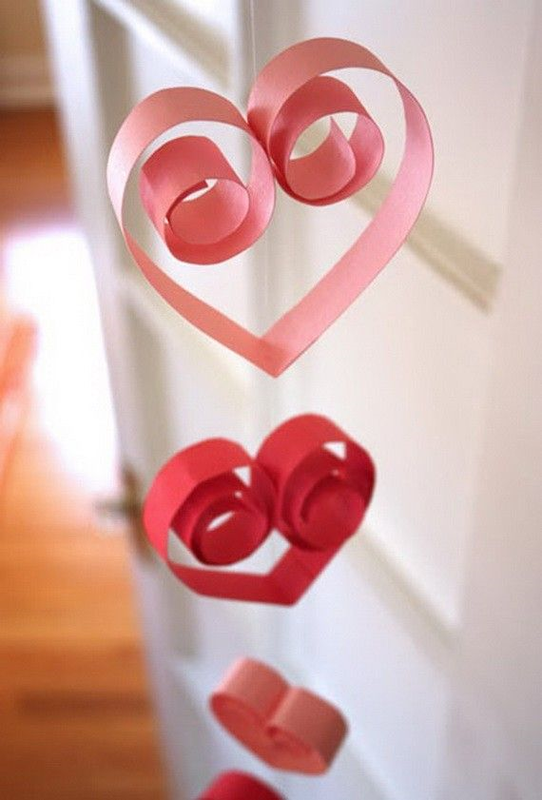 Bring the bedroom to life with this beautiful heart-shaped garland. Sure, you can pop this in just about every part of your house – across the mantelpiece, for instance – but you’ll adore having it hanging over your headboard so we recommend the bedroom for this one. This Valentine’s Day-themed garland is ridiculously simple to craft, requiring ribbon – or string, for that rustic look – some glue, and colored paper. Cut the paper into inch-wide strips and fold them into the shape of hearts, with a dab of glue at the end to hold them together. Then thread the ribbon through the hearts (you could also cut slits into the heart if you’d prefer a more defined hang, or use novelty clips to keep the hearts hanging in place). Now all you need to do is put it up and let your heart swell. Whether or not you’ve got green fingers, a beautiful bouquet of flowers simply must feature in your Valentine’s Day decor. They make wonderful focal pieces and engaging conversation starters – and they also look great in the home, too. Triple win! Of course, roses are the obvious choice, but this is another area where you can really get creative (or have a florist get creative for you), choosing flowers that have special meaning for you and your partner, or those with colors to match your home. 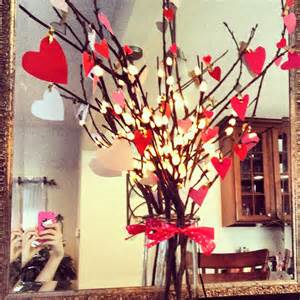 If you want to be a bit different, why not use firm branches and twigs, and decorate them with love hearts, lights, ribbons and even photographs of you and your partner. Tie it all together with a vase that can be decorated to suit your tastes, and place in an area that’s going to get as much attention as possible. This one may require a little time, but the end result is absolutely perfect. 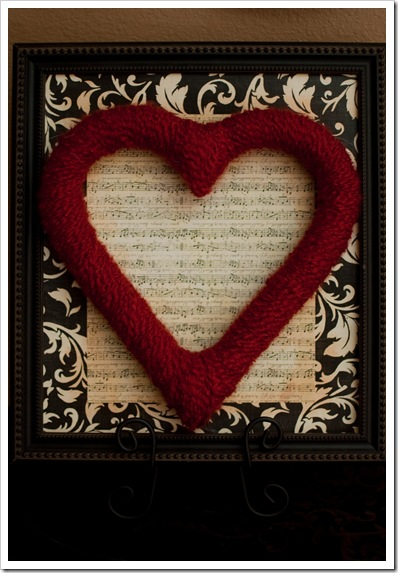 To create the homespun heart, you’ll need to make a solid heart shape (or buy a foam one) and get some glue, a picture frame larger than the heart, and some patterned paper and colored wool. Both the paper and wool should be in patterns that perfectly complement each other. Aww! Start by attaching the patterned paper inside the picture frame. While that’s setting, begin winding the wool around the heart shaper. For the best effects, wrap the heart at least twice, to ensure all gaps are covered. Now glue the heart inside the picture frame. Once it’s all dry, this will look stunning on the wall – and better yet, it can work all year ‘round. Now, with your home decked out with Valentine’s Day decor, you’ll be in the mood for love. Our favorite thing about these decorations, though, is that they also make great gifts, or Valentines’ surprises for your loved one; show you care by celebrating your love in the space that you share together.